I’m the first to admit it: Pregnancy was not a good look on me. Before you politely tell me you’re sure I was “glowing” or “all baby” or any other mom-to-be nicety, let me assure you that there is picture-proof to the contrary on the Internet. Said photo was snapped midway through my pregnancy. I was supposed to interview a particularly gorgeous celebrity about her beauty routine. She was running late, so instead of talking to her at her hotel as planned, we chatted as she walked through Times Square to her next appointment. Every few feet she’d stop and pose so that the paparazzi could get a good shot. The next day those photos surfaced on pretty much every gossip site on the Web. The celeb looked incredible, and there I was, the pregnant troll in the background, standing a few steps behind her with my recorder out and my mouth agape, mid-question. I’m pretty sure I cried and then laughed and then laugh-cried when those photos crossed my desk; I had never felt less attractive in my entire life. Of course, intellectually, I understood that no one was looking at me, but that didn’t help my own critical analysis. Some of the issues, like the ill-fitting hand-me-down maternity dress and topknot that looked more post-workout-disheveled than Meghan Markle-cute could be remedied with a shopping trip and a weekly blowout. But there was no quick fix for whatever it was that had happened to my face. The combination of hormone fluctuations from the pregnancy itself and going off birth control, a diet of primarily processed foods, stress, and general disruption to my skincare routine wreaked havoc on my skin. My previous pre-period solo pimple had blossomed into a full face of acne, and I was more or less defenseless to retaliate against it. During pregnancy I had given up my nightly retinol regimen, and thanks to my newfound superhuman sense of smell, the majority of my once-favorite luxury skincare staples were rendered useless because of their scent alone. Further adding to my haggard appearance were dark circles that would put a raccoon’s to shame. I have hereditary hollows under my eyes to begin with, and they only intensified once a good night’s sleep was just dream (if only I could fall asleep long enough to dream). And then there were the crow’s feet and horizontal forehead lines that I could’ve sworn weren’t there a week earlier…were they? In that moment and basically every day of my pregnancy thereafter, I wished for some kind of real-life filter. Before getting knocked up, I’d been relying on small doses of injectable wrinkle reducers and fillers that temporarily smoothed and plumped my face, respectively. But alas those treatments haven’t been studied in pregnant women so I didn’t want to use them. Argh. My only recourse was to stock up on full-coverage foundation and concealer and tough it out for a few more months. Now, when anyone asks me what I would’ve done differently prior to trying to get pregnant, a trip to the dermatologist is always at the top of my suggestion list. Because treatments for wrinkle reducers are recommended no more frequently than every three months and for fillers at least six to 24 months apart, timing the treatments is key if you don’t want to end up in the same unhappy skin boat as me. New York City dermatologist Dr. Sejal K. Shah recommends that patients come in for a treatment before they decide to start trying to get pregnant. “Many women think that they’ll wait until after they start trying to get pregnant, with the assumption that it’s going to take them three or four or five months to get pregnant, but then they end up getting pregnant right away,” she says. It’s important to talk to your doctor about any plans to become pregnant because the effects of wrinkle reducers during pregnancy are not known. In the grand scheme of things, would reducing the appearance of a few lines really have mattered while I was pregnant? Maybe not. 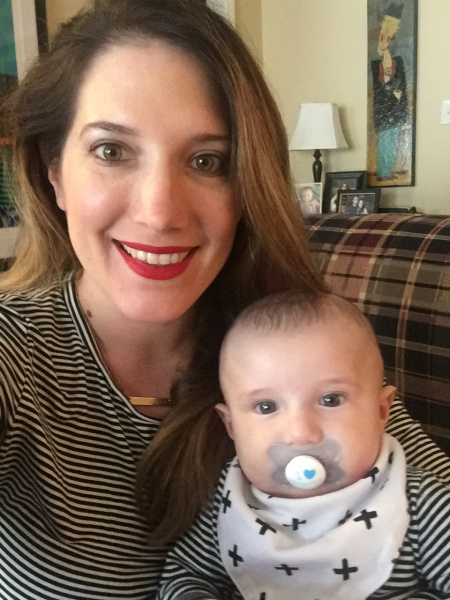 But you better believe the first thing I did when I stopped breastfeeding was book an appointment with my derm to attack those wrinkles with a wrinkle reducer! It took a few days for me to begin to see the effects of the wrinkle reducers, but I vividly remember waking up one morning after a particularly sleepless night with my now six-month-old son and being surprised by the woman staring back at me in the mirror. I may have felt like something out of The Walking Dead, but even without makeup I liked the way I looked. I wasn’t the only one who noticed, either. Right around the same time, people stopped asking me how exhausted I was and instead commented that my kid must be such a good sleeper, maybe because those lines on my forehead were not as easy to see. To be honest, he has yet to sleep through the night, but that’s information I’m perfectly happy keeping to myself — and off my face.